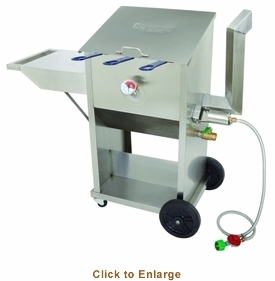 You�re viewing our Bayou Classic Stainless Steel 9 gallon fryer with 3 stainless steel baskets. V-bottom design prevents batter scorch, minimizing burns and keeping oil clean and fresher longer. Built from 18-gauge solid stainless steel. Includes locking casters, drain valve and temperature gauge. Comes with 3 stainless steel fry baskets, cart, fixed side shelf, 10 PSI preset regulator, temperature gauge, and a stainless steel braided hose. Propane not included. Basket size: 13"L x 5.75"W x 5.50"D.
Our 9 gallon fryer comes with a manufacturer warranty. Please contact us with any questions you may have about our products. 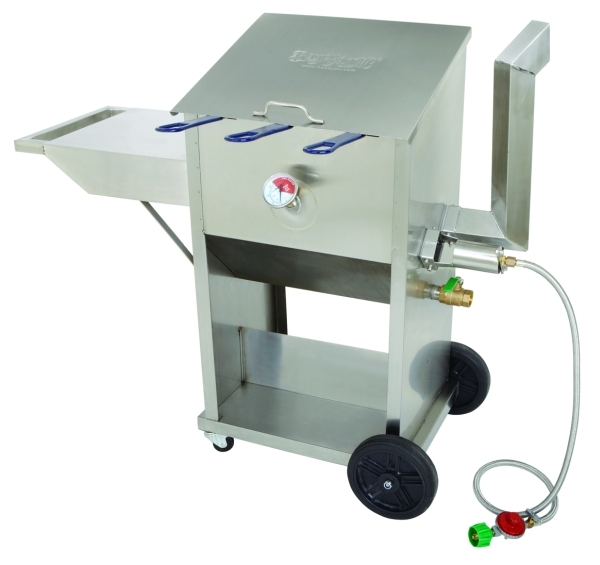 Scroll down to view our Bayou Classic 9 gallon fryer with 3 stainless baskets. BTU-75,000.